Prof. Kathleen Cullenand her PhD student Jess Brooks of the Dept. of Physiology have been able to identify a distinct and surprisingly small cluster of cells deep within the brain that react within milliseconds to readjust our movements when something unexpected happens, whether it is slipping on ice or hitting a rock when skiing. What is astounding is that each individual neuron in this tiny region that is smaller than a pin's head displays the ability to predict and selectively respond to unexpected motion. It happens to all of us at least once each winter in Montreal. You’re walking on the sidewalk and before you know it you are slipping on a patch of ice hidden under a dusting of snow. Sometimes you fall. Surprisingly often, you manage to recover your balance and walk away unscathed. McGill researchers now understand what’s going on in the brain when you manage to recover your balance in these situations. And it is not just a matter of good luck. Prof. Kathleen Cullenand her PhD student Jess Brooks of the Dept. of Physiology have been able to identify a distinct and surprisingly small cluster of cells deep within the brain that react within milliseconds to readjust our movements when something unexpected happens, whether it is slipping on ice or hitting a rock when skiing. What is astounding is that each individual neuron in this tiny region that is smaller than a pin’s head displays the ability to predict and selectively respond to unexpected motion. This finding both overturns current theories about how we learn to maintain our balance as we move through the world, and also has significant implications for understanding the neural basis of motion sickness. Scientists have theorized for some time that we fine-tune our movements and maintain our balance thanks to a neural library of expected motions that we gain through “sensory conflicts” and errors. “Sensory conflicts” occur when there is a mismatch between what we think will happen as we move through the world and the sometimes contradictory information that our senses provide to us about our movements. This kind of “sensory conflict” may occur when our bodies detect motion that our eyes cannot see (such as during plane, ocean or car travel), or when our eyes perceive motion that our bodies cannot detect (such as during an IMAX film, when the camera swoops at high speed over the edge of steep cliffs and deep into gorges and valleys while our bodies remain sitting still). These “sensory conflicts” are also responsible for the feelings of vertigo and nausea that are associated with motion sickness. But while the areas of the brain involved in estimating spatial orientation have been identified for some time, until now, no one has been able to either show that distinct neurons signaling “sensory conflicts” existed, nor demonstrate exactly how they work. 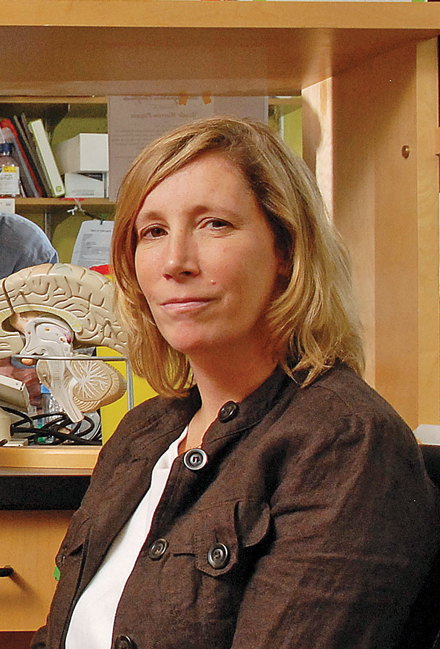 By demonstrating that these “sensory conflict” neurons both exist and function by making choices “on the fly” about which sensory information to respond to, Cullen and her team have made a significant advance in our understanding of how the brain works to keep our bodies in balance as we move about. The research was done by recording brain activity in macaque monkeys who were engaged in performing specific tasks while at the same time being unexpectedly moved around by flight-simulator style equipment. To read the full paper in Current Biology click here.